The Institute of Internal Auditors - Houston Chapter presented the Department of Accountancy & Taxation at the C. T. Bauer College of Business with a $100,000 check to create an endowment for the newly designated Center of Excellence in Internal Audit program. 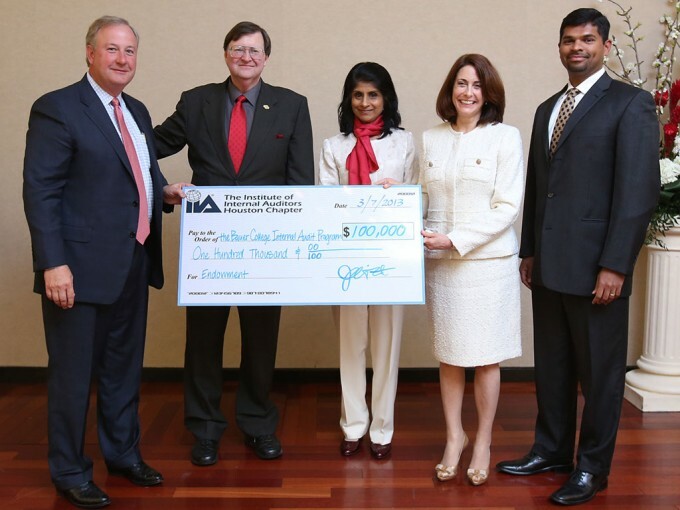 From left, Larry Abston, president of Houston IIA, Michael Newman, director of Accounting Programs at the Bauer College, Latha Ramchand, Bauer College dean, Kaye Newberry, chair of the Accountancy & Taxation department at the Bauer College, and Rumy Jaleel-Khan, chair of the Academic Relations Committee for Houston IIA. The C. T. Bauer College of Business at the University of Houston has been recognized by the Global Institute of Internal Auditors for having an exemplary program in internal auditing. Designated as a “Center for Internal Audit Excellence,” the UH Bauer Internal Audit Program joins only two others in the nation and only five others in the world to have achieved this honor. The Houston Chapter of the Institute of Internal Auditors hosted a dinner on March 7 at the Houston Racquet Club to celebrate this extraordinary accomplishment. The chapter, an organization integral to UH Bauer’s designation as a Center of Excellence, presented the college with a $100,000 check to create an endowment ensuring the program’s continued success. Rumy Jaleel-Khan presents Michael Newman with a certificate from the IIA designating the UH Bauer Internal Audit program as a Center of Excellence. Michael Newman, who serves as director of accounting programs at Bauer, highlighted several of those key players as he described the program’s history and path to becoming a Center of Excellence. While the IIA funded the college’s first internal audit course in the 1980s, the program really took off in 2003, as a result of the efforts of Professors Jim Pratt, Michael Parks, Thomas Noland and Jim Stinson. Kaye Newberry, chair of the Department of Accountancy & Taxation, credited the Houston IIA for the program’s success. “We wouldn’t have made it without a strong local chapter,” she said. She went on to highlight the critical role the endowment would play in attracting the best students to the program. “Our end product will be your resource, because we want to graduate students that you want to hire,” Newberry said. The importance of the Bauer College/IIA Houston partnership was shared by Margie Bastolla. As the Vice President of the IIA Research Foundation, Bastolla commended the college on a job well done in achieving the Center of Excellence designation. She credited the mutually beneficial partnership between the IIA Houston Chapter and Bauer, with each being essential to the success of the other. These sentiments were echoed by Veronica Johnson, who played a key role in helping Bauer envision and become a center of excellence. She read a message from Harold Silverman, Chairman of the Global IIA Academic Relations Committee. To see more pictures of the March 7 event, click here.